GROWIE® is an environmentally friendly promotional item made of bioplastic. GROWIE® is designed according to the guidelines of ecodesign and follows the principle of the cradle to cradle concept. 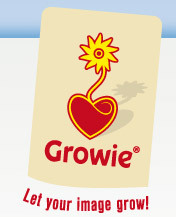 Each GROWIE® takes any desired shape – no matter if your Logo or symbols like heart, star and smiley etc. Each GROWIE® carries something very special on the inside.